Mobile Solutions for Act! - Twelve/Three Marketing, Inc.
Handheld Contact is a 3rd party Act! add-on developed by a company called Keystroke. We prefer it as the most superior way of synchronizing two-way data from your Act! database to your phone. 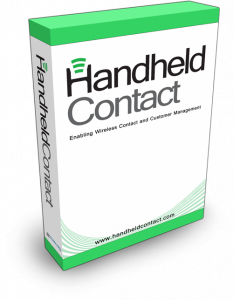 Handheld Contact works via cloud sync. Software is installed on your main Act! computer, which sends contact & calendar data up to a cloud server. Using the HHC app (available on iOS App Store & Android Google Play), your phone can then retrieve this data. Data is saved locally to your phone in an app, so it loads very fast! APFW is built in to Act! Premium databases at no extra charge. Ideally, it should only be ran on a company server. APFW can open a web portal to your database so that any device – mobile or desktop – can securely login via a web client. There is no sync necessary; any device that logs in through the web client is seeing the master database. Every custom field, note, history, opportunities, and much more is available.